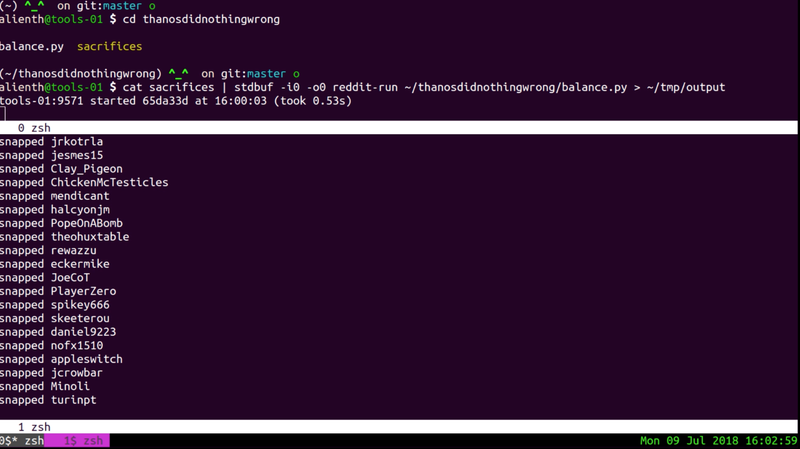 Perfect balance has been achieved. The r/ThanosDidNothingWrong subreddit is now better equipped to allocate its precious resources after moderators randomly banned half of its members. Was I among those culled? Well, all I can say is: I don’t feel so good right now, Mr. Stark. The subreddit — created in the wake of Avengers: Infinity War to celebrate Thanos’ awful plan — made waves after subscribers started begging for half of them to be banned from the subreddit in the name of perfect balance (sort of like that website that checked if you were killed during the events of Infinity War). After the subreddit finally agreed, the community grew to over 700,000 members — most of whom (myself included) were seemingly more interested in being part of the experience than actually supporting anything Thanos ever did. The livestream showing the culling on Twitch. The inevitable mass ban garnered the attention of the Infinity War’s directors, the Russo brothers, as well as star Josh Brolin, who marked the occasion beforehand with a celebratory snap of his fingers. Then tonight, as almost 60,000 tuned into a Twitch stream, Beethoven’s “Moonlight Sonata” signaled the arrival of the coming doom. Snap. Half the group is being culled as we speak (the whole process should take several hours). I’ll update you when I find out if I survived. So far so good, but I’ve only got a 50/50 chance, people. This group “dusting” marks the largest mass Reddit ban in the site’s history. But don’t worry, it’s not the end for those who have been shuffled off this mortal coil. Fans who were banned from r/ThanosDidNothingWrong have been heading over to the new subreddit r/InTheSoulStone, where they were will surely haunt Thanos for generations. In the name of perfect balance.